Charles Coe (Poetry Fellow ’96) is an active contributor to the literary community and worked with us at the Mass Cultural Council 1997-2015. So we were thrilled to ask Charles a few questions about his “other life” – and his new poetry collection All Sins Forgiven: Poems for My Parents. ArtSake: Did the central idea of your collection – poems for your parents – steer you writing? Or did the theme emerge from the direction of your poems were already taking? Charles: As a writer, you know that lot of what we write insists on being written. There were poems about my parents from my first book in 1999; they were still around at that point, although they were starting to go downhill. I began to realize that there was a lot I wanted to say about them – and about our relationship. ArtSake: What has been your experience with your publisher, Leapfrog Press? Charles: They’ve been very supportive. Leapfrog was started by Marge Piercy and her husband, Ira Wood, but they sold it a few years ago to Lisa Graziano, who moved it from Wellfleet to Fredonia, New York. The press had done Picnic on the Moon, my first book, and I was contractually obligated to offer them my second, although they weren’t obligated to publish it. Fortunately Lisa was very happy with the manuscript for All Sins Forgiven and has been behind the book 100 percent. ArtSake: How does your background as a musician impact your poetry? Charles: I try to create a musical flow in my work; I guess that comes from my background as a singer/songwriter. But my approach to writing poems and writing songs is very different. My songs are in a conventional style with rhyme and meter, but I very seldom use either in my poetry. However, there are a couple of haiku in the new book. And one villanelle, which has a very specific and traditional form. For me, writing a poem is like playing a jazz solo. I’m going for something that holds together and flows at the same time. The poetry I’m drawn to has a musical quality; your tongue doesn’t trip or stumble. I think all writers and poets should read their work aloud, poetry or prose. Your ear can identify problems you can’t always catch on the page. ArtSake: Does your work as a poet and music artist inform your work as an administrator at Mass Cultural Council? Charles: There’s a great synergy between my work as an artist and my work at Mass Cultural Council. When I go to visit organizations as an administrator, they know I understand the challenges of making art. I’m not just some guy with an armload of files and a bunch of opinions. ArtSake: Were any artists – literary or otherwise – particularly influential to you as you wrote the poems of All Sins Forgiven? Charles: Very long list. Robert Frost, Gwendolyn Brooks, Langston Hughes, Billy Collins, Robert Hayden, among many others. A lot of their work is about ordinary life, which I often write about as well. ArtSake: Your involvement in the poetry community goes beyond writing. You’re involved in the National Writers Union and you organize events (including a reading with Richard Hoffman and Susan Donnelly at the upcoming Mass Poetry Festival). Is giving back something you’d recommend to other poets, writers, and artists? Charles: Absolutely. A poet has many opportunities to contribute to the community. I do a lot of free readings to help raise money for community organizations. I think artists need to move beyond being providers of cultural “product” and look for ways to be neighbors, to be part of the community ecology. It’s the right thing to do and an excellent way to reach new audiences. Everybody benefits; it’s not missionary work. 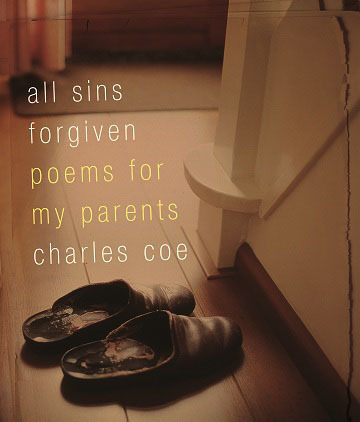 Charles Coe will read from All Sins Forgiven at a the Book Launch Event at the Cambridge Public Library (Main Branch), Sunday, April 7, 2 PM. Also, he’ll read at the Fitchburg Library (4/1, 6:30 PM), Porter Square Books (4/10, 7 PM), Uno’s Restaurant in Hyannis, Writers Night Out (4/17), Newtonville Books (4/22. 7 PM), and Newburyport Literary Festival (4/27, 2 PM). 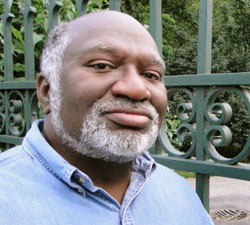 Charles Coe, Program Officer for MCC’s Cultural Investment Portfolio, is the author of the poetry collection Picnic on the Moon. His poetry and prose have appeared in numerous newspapers and literary reviews and magazines, and his poems have been set to music by composers Julia Carey, Beth Denisch and Robert Moran. Charles also writes feature articles, book reviews and interviews for publications such as Harvard Magazine, Northeastern University Law Review and the Boston Phoenix. In addition to his work as a writer, Charles has an extensive background as a jazz vocalist and has performed and recorded with numerous musicians in the Boston area and throughout New England.